OK, my kids are right. I’m a geek. In the diabetes world, the answers to get to the desired insulin treasure are a bit intriguing. Well, our quest isn’t quite at an end. But we’re getting closer. market in various parts of the world, and is awaiting FDA clearance here in the US. 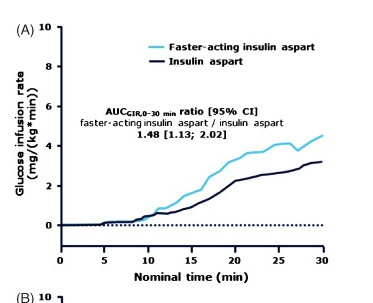 The good news is that it IS faster than the rapid insulins we’ve been using for the past 15+ years (aspart, lispro, glulisine – brand names Novolog/Novorapid, Humalog, Apidra). The bad news is that it is just slightly faster, and still nowhere near as fast-acting as the insulin the pancreas produces. It’s also not quite as fast as inhaled insulin (Afrezza) or injections of rapid insulin given into muscle. But it is an improvement. By adding niacinamide to the formulation, the insulin molecules form monomers (single pieces of insulin) that move through the subcutaneous fat layer faster than before. How much faster is FiASP as compared to normal insulin? Its onset of action is about 6 minutes earlier, the peak is 7 minutes earlier, and it works 50% harder during the first 30 minutes compared to traditional aspart. The result: Better post-meal patterns with a peak that is approximately 40mg/dl (2.2 mmol/l) lower. What about the duration of action? It takes just as long to finish working as the rapid insulins that are currently on the market. Although it starts out faster, FiASP has a long tail of action. However, when used to correct high blood sugar, you will notice a more rapid decline during the first 30-60 minutes. Will FiASP be approved for use in insulin pumps? 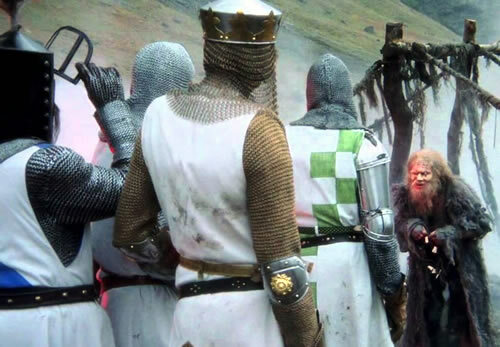 Yes, but beware: The “insulin on board” algorithms will be rendered somewhat inaccurate. Those algorithms are based on the action profile of traditional rapid insulin, so when using FiASP, the pump will over-estimate IOB during the first two to three hours. It may be necessary to set a slightly-shorter duration of insulin action in order to have the pump calculate IOB correctly (for example, setting 3.5 hours rather than 4.0 hours). Does dosing need to be changed when converting from rapid-acting to FiASP? 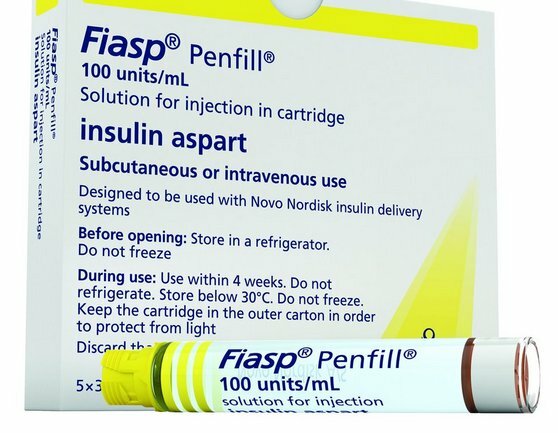 Unit-for-unit, FiASP has the same potency as rapid-acting insulin, so it should be a relatively easy conversion, and one that I would recommend to most people on pumps and multiple injection programs. However, don’t fall into the trap of thinking “this stuff is faster… I don’t have to take it ahead of time.” That’s like buying reduced-fat snacks and then eating the entire package because they’re… well… better for you. Users of FiASP will still need to pay attention to the timing of their bolus insulin. In order to see the benefits of the faster onset, it will need to be taken at the same time you take your insulin currently. Taking it later will negate the benefit. And with slowly-digesting meals/snacks, it will be more important than ever to delay the injection (or use a dual/combo bolus) in order to prevent post-meal hypoglycemia. So at least we’re on the right track. Much faster insulin is going to be necessary if our “hybrid closed loop” systems are ever going to become full closed-loop systems. But for now, an almost Holy Grail is better than no grail at all. Hmmm… Well, I’m not quite as excited about FIASP as I thought I’d be. Sounds like getting highs down quicker is the best part of it. Should lead to more time in range. More trial & error to come! Thanks for posting the review! i’d take issue with some of this. i’ve been using it for the last 2 months. It works immediately – and i mean immediately. I had to change the period of action on my pump from 4 hours to 2 and a quarter hours. It tails off much more quickly. It’s fabulous – my after meal highs are GONE. The only meal which this is not true of is breakfast – hormone-induced highs seem impervious, i deal with this by giving myself a correction on waking and a third of my breakfast insulin. Then the rest just before breakfast. This works. NOTHING has ever worked before. You are warned not to take the insulin any more than two minutes before a meal, and i have found longer than 5 is a problem. For me, it works as fast as i would like it to work – any faster I think would be a problem! Yes everyone here at IDS have personally used Fiasp. none of us found the quick onset that you did. But anytime someone finds themselves outside the norms of insulin action they should adjust their therapy to their needs. Glad you’ve had success with it, and that you are making it work for your needs. Thanks, that’s good to know as I’m about to start on this insulin with my pump. In terms of your morning highs, two things raise your blood sugar in the night/morning: i. growth hormone (even in adults) is released around 3-4 am which stimulates cortisol production and raises blood sugars; ii. “blue light effect” occurs when you wake and come in contact with sunlight, this again stimulates cortisol production and raises blood sugar. One of the benefits of insulin pumps is that they are designed to solve this problem (though they have to be adjusted over time to tackle it) by varying background/basal insulin to match your body’s circadian rhythm. Injections can only deliver background insulin which is roughly a flat release in comparison. So you should either be on an insulin pump to prevent the morning highs, or if you are on a pump your basal level needs adjusting according to you blood sugar levels. Meals for which I would have needed 30-45 minute pre-bolus now need only approx 10-15 minutes. The ‘significantly faster to peak action’ means boluses for more rapid acting carbs (eg white bread) can be taken just before eating and give reduced BG spike post-meal. Corrections with NovoRapid which often showed little effect for the first 60-90 minutes are now beginning to reduce BG within 30-40 minutes. Moderate carb load meals (eg basmati rice) which Novorapid ‘matched’ in absorption/action profile now need careful dual wave handling to avoid post-meal hypoglycaemia at 60 minutes. Duration for me seems to be about 25% shorter than NovoRapid – though of course it is always difficult to spot exactly when the tail is ending. In short my n=1 is that it the difference is significantly more than 6 minutes/7 minutes earlier action suggested. I’d be interested to hear how others have been finding it. We are hearing reports from patients of varied, or diminishing results with Fiasp. However, others continue to use it with no issue and great results. We hypothesize that some people may see an auto immune response to Fiasp as many users find that returning to novolog or humalog for a period, then going back to Fiasp mitigates issues for a while. One thing diabetes teaches us is that sometimes, the way the textbook says things should work, and they way they work in our differing bodies just does not quite match up. But it is good to have the option to try. Sounds like your having a problem with insulin absorption (or resistance). I’ve just been told, by my diabetic nurse, that there are new high concentration insulins designed specifically to address this. Apparently less (but higher concentration) insulin = better absorption. Problems with injection sites may produce the same issue. I don’t remember who is making it (think it may just be, e.g. humalog but more concentrated), but you should look into it. It’s only fo injections though, not pumps at this stage. Good luck. I am having the same problem, although only on day two of use. It doesn’t seem to have much impact at all on my BG after eating, but I haven’t used it as a corrective dose yet. But it certainly doesn’t seem to work as effectively as my humalog. Does anyone else find that it takes a while for it to settle in once switching over from another insulin type? I will give it a few days, but I’m wondering if I’m one of those it doesn’t work effectively on…. Thanks for the review Gary. Although a little faster action sounds good, I’m sure this insulin will still carry a hefty price. I would be more excited if the rapid acting insulin manufacturers would deliver on better pricing at this point if no new breakthroughs in therapy are emerging. I will be dealing with Medicare very soon and when you hit that donut hole in coverage, it is very scary to make it through to the other side of the donut hole and still be financially solvent! If you have an insulin pump, Medicare will pay 80% of the cost through part B. It is considered durable equipment. You don’t have to worry about the donut hole. If you do not have a pump, then your drug plan pays. Good luck with that. You will hit donut hole soon. They may not cover it at all if not on their formulary. I did read that it will be the same price as Novolog. Pat Tennies: Medicare DME won’t pay for Fiasp in the US because it hasn’t been approved for pump use………yet. I’ve been fighting with Medicare, Noridian, and Walgreens for 2 weeks and have lost the battle twice even tho’ my endo put me on it a month ago. I have achieved 50% better control the last month. Guess I’ll just have to go back to using Novolog until Fiasp gets approval for pumps. Hopefully sooner than later. Some drs will just write a letter of necessity. Use vague wording implying maybe you are using the Fiasp to inject boluses and the pump is your basal. What niacinamide and what kind of long term effects does that have? My experience of Fiasp is rather different from what you’ve written above. I (and quite a few others) have found that we can take it immediately prior to eating and experience very minimal post prandial rises in blood glucose, indeed, I have tested in with a fairly boring white bread and jam meal, with an immediate pre-prandial dose, and found no rise in glucose levels.A fair number of people have found that bolusing as you would with normal fast acting insulins results in hypos very soon after eating. As always, your diabetes may very, and not everyone sees the same effects. The other thing to note is that the duration is the same as that of Novorapid. Whilst the curve shape is slightly different, i.e. there is less insulin on board between 3 and 6 hours, it’s very much still there, and setting a pump DIA to 3.5 hours will significantly underestimate this factor out at these times. Thanks for the review. I have switched but I am only three weeks in. As suggested post meal spikes are smaller and have become blips on meals of less than 30g CHO. For bigger meals it is a lot less predictable. It stings when delivered. I tried extending to 15 min but that just prolonged the stinginess. As said correction work more quickly. I have decided to give it a proper try and do at least three months. The benefits need to outweigh the stinging in delivery. I picked this up in Canada last week. I’m very disappointed. I see almost no difference between Fiasp and the usual suspects . I was so excited to try it but for me it’s been a dud. Medicare saved me money on my insulin. I use a pump, which makes insulin covered by part B, not Part D, of Medicare. With my Plan G supplement insurance, after I meet my annual deductible of about $166, my insulin has no out-of-pocket costs. very true, Afrezza is pretty amazing at its speed. But, it’s not for everyone. There many people who can not get the tight dose control needed, or who have respiratory issues. Fiasp gives them a great new option. Alicia Downs, my doctor has given me FIASP to try and I haven’t had good post meal numbers majority of the time. What do you charge to help clients with insulin management? 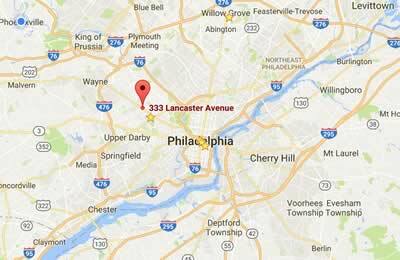 I recommend giving our office a call. 610-642-6099. One of our office staff can walk you through our services and pricing. WE look forward to working with you! Since pumps also deliver basals, how does fiasp’s faster action affect basal dosing? great question. There is no adjustment needed to basal dosing with Fiasp. Since basal dosing with a pump is a series of micro doses over 24 hours, those doses are designed to overlap in action. This is actually why basal insulin dosing works. So the change over to Fiasp requires no change at all to basal dosing or timing. I have not tried Fiasp but I do use Apidra and I do find it to start much more quickly than any other insulin and importantly to finish working much sooner. The tail of all the other insulins caused me issues. What I find interesting is that most people do not find a difference in the insulins while some people do find Apidra and Fiasp to work more quickly and at least for me with Apidra to have a shorter tail. What would be interesting to research is why? FWIW have been a T1 for almost 50 years so have been on all the different types of insulins for several years, never just a short few days or weeks and also have used all the fast insulin in a pump and with intensive BG testing either fingersticks or CGMS. So again accurate data generation. I do have to adjust my basal rates with the different insulins. I would not switch to Fiasp if it had a longer tail than Apidra in my system. I believe it’s a good option. For me though for perfect glycemic control it’s Afrezza everytime. The problem with FIASP is that it hangs around too long. Afrezza clears much faster and flat blood glucose profiles are possible with minimal effort. I love Afrezza. Has anyone had any experience with Fiasp with 670G and Guardian 3 system? I’ve been on this since early December. Generally doing well but I was hoping to see a better HgbA1C. I was thinking of trying Fiasp to bring down my postpradial highs. I’d be interested in other’s experinces. Also, trying to decide when I try if whether to change my active insulin time from 4 hrs to 3.5. Multiple educators at IDS have been using Fiasp. The most important take aways are that it is not a replacement for prebolusing, it is a supplement to it. To not prebolus makes fiasp the same as novolog with a prebolus. The second take away has been that the full 4hour action time of Fiasp is the same as the 4 hour action time of novolog. so shortening the DIA tends to increase post correction lows. I have used humalog in my insulin pump and opposed to Fiasp I have seen a big difference in my blood sugars with this faster working insulin. I am prone to weight gain – 3 stone with apidra. Doing weightwatchers so not down to my diet. It is listed as a major side effect for fiasp. Has anyone actually experienced weight gain on it please? The only insulin I have found which does not do this to me is porcine- which I currently use in my pump. My DSN would like me to try it and I am keen to have better control but want to find out more about weight gain. I have been on Flasp for 2 days now and have had highs for this period of time. I have had highs thru the night although I am bolusing and during the day, same thing. It’s like i’m taking water! Every unhappy. Is it just me, or has anyone noticed that you can feel it going in moreso than other insulins? It seems to have a bit of a sting. Not really painful or anything, but I can definitely tell something’s entering my body whereas I never felt it with other insulins. Does your office receive any funding or donations from Afrezza or FIASP or their manufacturers or their subsidiaries? Sorry for the mistrust. I’m type 1. I work in a medical field. Gotta ask. We pay for our meds and tech just like everyone else. One of our educators may occasionally be asked to share our skills, education, and experience with other educators, and may be compensated for their time, but we don’t promote any specific products or services. Since we all live with type 1 diabetes in our own lives we trust and respect our peers and community too much to compromise our clinical or personal integrity. We do our best to share well rounded unbiased information based on our personal, professional and clinical experience, and/or on statistical data when available. WE definitely understand your skepticism, we don’t appreciate being “sold” on meds or tech any more than you do! I have been on Fiasp for the last month. I am on a pump. It works for about a day and half. Then its like I have no insulin. Consistently getting worse. Last two weeks, sugar levels over 400. Last night I had high ketones. Had to call in middle of night and get a new script for different insulin.On humalog, I had no issues. Unfortunately, I had to change from a really great doctor to a new one. My other dr. is retiring. I have received little or no help. I’m told, to just give us a call if you have any problems. I dont hear from them for 3-4 days. Very frustrated with whole situation. I started Novalog last night. Hoping for better results. Very disappointed with Fiasp. After time we have heard from more and more patients that Fiasp is not a good fit for everyone, Some patients experience increased occlusions when pumping, others experience reduced efficacy. We work very closely with our patients here at IDS. We offer a level of education and support that most clinics and practices simply are not able to provide, because we lived that frustration as well. I am three weeks into using Fiasp instead of Novorapid. I use a Guardian Connect CGM system. I have counted the number of units of Novorapid injected during the three weeks before switching to Fiasp and the number of units of Fiasp injected during the last three weeks. All things cannot be equal, of course, but I have just lived my normal daily life and been following normal daily routines. I have seen an increased consumption by 50% with Fiasp and a lot of highs which did not not really come down even with two hourly injections of between 20 and 30 units. As somone wrote, it was like I injected water. I will quickly return to Novorapid and wait for the next Holy Grail. 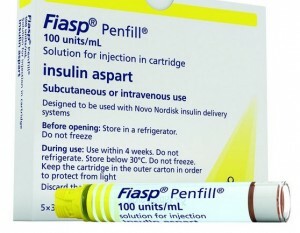 just started on Fiasp and I too find it utterly ineffective actually my sugars go up MORE and take LONGER to come down than when using apidra .. yesterday for example they took 4 hours to go down after injecting and when up IMMEDIATELY after eating and continued to RISE for a couple of hours after eating which is the opposite of the other types I have used. I have to take it EARLIER than the apidra I used before and the sugars go up way higher after eating……. Hi, Glad I found this place, after 40 years of being Type 1 Diabetic and reading all your posts I feel I just graduated from Kindergarden. it looks that my scheme is so primitive, I am only on injections, I never dear to use a pump, just las year I started with Dexcom G6 to monitor my glucose level. I use Novolog for rapid, Levemir for basal, and Victoza to help lower my A1c. I was looking for newest insulins specialy the rapid one and thats why I landed here. And I found a new world here, can someone tell me where to go online to learn a little more how to manage my diabetes, because I never payed to much attention to de basal Insulin, so some times I use more, some times less and i don’t see any difference.